Dean has this lovely T-Shirt that says “Dry Lake Speed Racing” on it and is made by Lucky Brand. 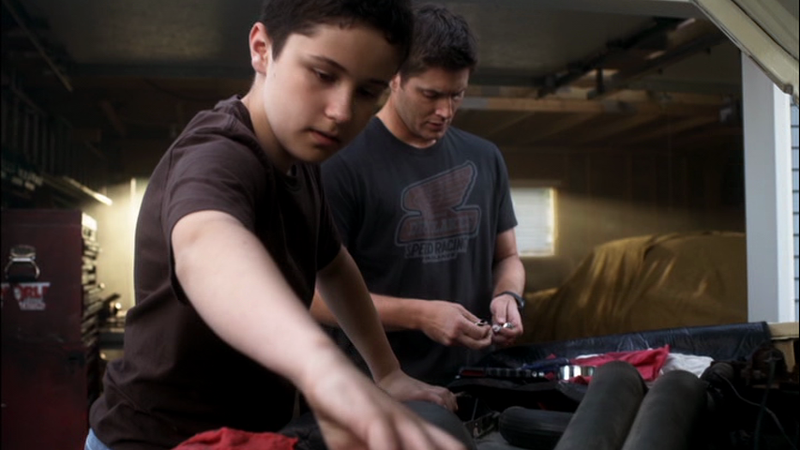 In Exile on Main St. (6x01), Dean wears this shirt while he and Ben work on the truck during the montage of his life with Lisa and Ben at the beginning of the episode. In Meet the New Boss (7x01), Dean once again wears this shirt while he works on the Impala, this time with Sam, while they listen to the radio and hear about Cas killing motivational speakers. Yay! It's really fun when people find the shirts in real life. Most of they're shirts are either not name-brand, or they aren't a distinguishable name brand - so it's a rare event to be able to track one down! I also want to tell you how much I admire your clothes cataloguing project! It's amazing, and a really fun resource. Thanks for sharing so much wonderful detail! Thank you and you're welcome! I'm just really glad that other people like it and find it useful - when I first started making it, it was just to satisfy my own curiosity. Ah, I wasn't quick enough on the ball there - but thanks for the heads-up about it!